A little of our backstory. I rescued a BP about a year ago. She's my first snake. I was asked to take her because the owners knew that in addition to the typical cute and fluffy pets, our critter kingdom also includes a hedgehog and three tarantulas. She was living in a filthy tank, which was way too small for her, had a hide that was too small for her, had a teeny-tiny water dish, and was on the most bizarre feeding routine I had ever read about. At the time, she was 3-1/2 feet in length and was getting three small live mice every two weeks (because supposedly she refused to take frozen/thawed). She had a UTH, but neither the temperature nor the humidity in her tank were ever monitored. By my best guess, she's between 2-1/2 and 3 years old (owners not sure how old she was when they got her or exactly how long they had her). She's been shedding every 6-8 weeks and has grown quite a bit since I've had her. Technically, she's unsexed, but since she's getting closer to 4 feet, I'm assuming she's female. Since it's 75 miles to the nearest person who is comfortable sexing her, she's just going to be a girl... whether she's male or not... because I'm not willing to stress her with that long of a car ride. I'm happy to report that she now lives in a clean, properly-sized environment with two hides, a water bowl big enough for her to soak in, appropriate temperatures and humidity, lots of greenery and rounded branches to climb, and I transitioned her to frozen/thawed rats with no problems. She had been taking one small rat every week. Lately though, her feeds are more frequent with fewer days in between (three rats a week). I know she has outgrown the small rats, but I was hoping to use up her present stash before upgrading her. My question is, is it okay for her to be feeding every 2-3 days, and can I jump from small rats to large rats without going to medium first? I don't want her stress her belly. Thanks in advance for any advice. I truly appreciate it! How much does she weigh? That will tell you what size to feed. Also she should be eating at a minimum ever 7-10 days. Three rats a week is way too much food. Slow it way down and get a weight on her. can someone post the weight to food chart? Agreed... needs to eat no more often than one appropriately sized prey item every 7 days. 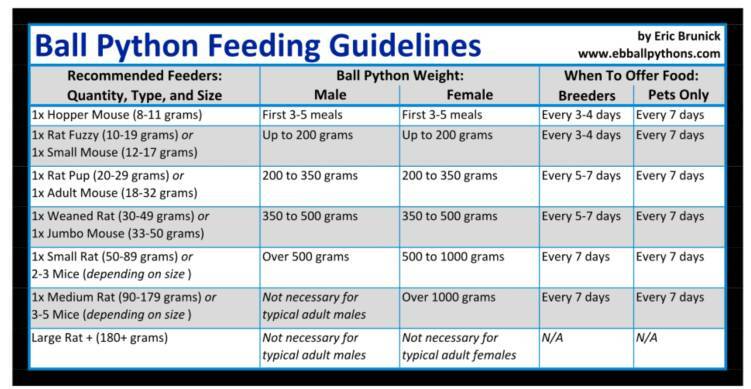 Many people will feed adults every 2 weeks after they're a few years old to avoid obesity issues when they're just pets rather than breeder snakes. Weigh the snake to find out for sure what size prey to feed. Thank you so much for the advice! I'm pretty new to this and still learning. Thanks for helping to teach me what is best for my snake. My first and foremost concern is providing the best care I can for her to keep her healthy and happy. I'll be weighing her tomorrow so that I know what size rodents to be feeding her. It's been a week since she last ate, and I plan on feeding her either tomorrow after I weigh her or Thursday... and she will be getting an appropriate amount of food this time. I really don't need to be enrolling a snake in a weight-loss program.